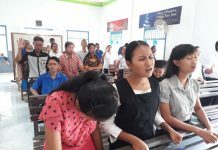 Blessed be the Lord who proclaimed His power in the village of Hilibadalu, Lahusa Subdistrict, South Nias, North Sumatra Province. 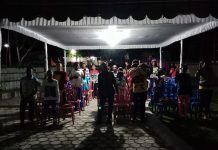 On September 25th, 2015, KPPI team served at BKPN (Banua Keriso Protestan Nias) Fasaradodo Church in Hilibadalu Village, Lahusa Subdistrict, South Nias who is grazed by Rev. Anita Laia. KPPI was held at BKPN (Banua Keriso Protestan Nias) at 8.00 PM. Even though the electricity went out, but did not reduce the congregation’s longing to come to KPPI. At 8.00 PM the congregations had already filled the church and the worship leader asked them to praise God. The present congregations praised and worshiped God sincerely. Ms. Dona Situmorang (KPPI team) delivered Word of God Matthew 8: 1-3, about a leper who had been healed by God. The servant of God invited every congregation to come and believe in God. Continued delivering the Word from Isaiah 53 about Jesus’ sacrifice on the cross to pay for our sins and sicknesses. That evening almost every congregation in attendance wanted to accept Jesus as the Lord and Savior. 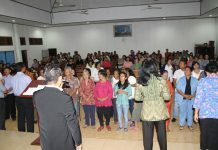 Praise the Lord, there were 250 congregations who were present that evening. When healing prayer the sick came to the front to be prayed by the counselors. The Lord Jesus does not change, He remains the same. In the evening there was a man who had waist pain, he felt the change, he could bend until his hands touched the ground, before he could not do. There was also a woman whose legs, hands, and head were painful for 2 years, after being prayed she was cured. Praise God! God gave healing, some were healed from back pain, blindness, foot pain, hand pain, headache, and ulcer. Hallelujah! The Lord Jesus is very good and He revealed His work in the village of Hilibadalu.